Let the kids burn off some energy on the football field at Domaine des Ormes campsite. The children will love the waterslides at Domaine des Ormes campsite. Domaine des Ormes campsite is a Eurocamp splash park. Make the most of the nearby beach while staying at Domaine des Ormes campsite. If you would like to try horse riding, you'll be pleased to hear that this is available. Try some of the water sports available. Want to explore the park - take a look round the lake. Worried about the temperature of the outside pool? Don't be, a covered pool is available at Domaine des Ormes campsite. Domaine des Ormes campsite has plenty of areas for you to explore. Want to have a closer look at Domaine des Ormes campsite? If you think Domaine des Ormes campsite in Dol-de-Bretagne, Brittany is the holiday park you, why not have a closer look, and check out prices and availability. 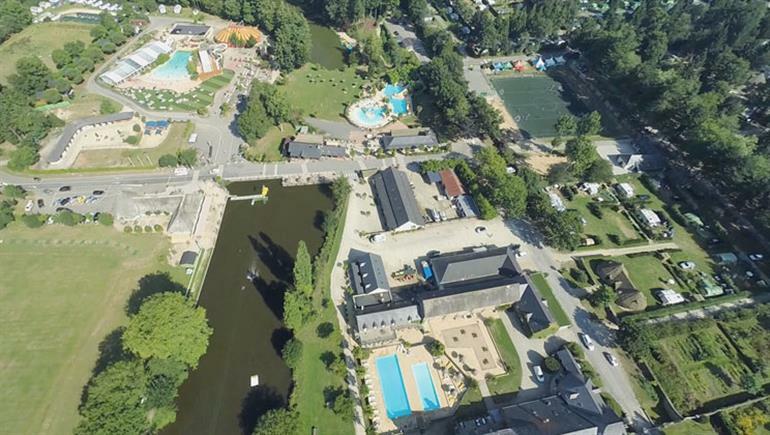 Domaine des Ormes campsite family holiday park has 700 pitches. Eurocamp have family holidays parks all around Europe. 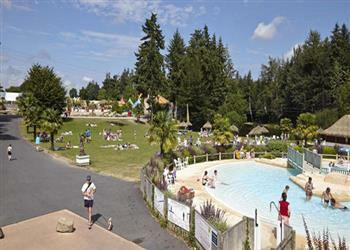 Domaine des Ormes campsite (BN013) is just one of the family holiday parks in Dol-de-Bretagne, Brittany, France. Have a look for other holiday parks in France. You can also see what other people though with the reviews of Domaine des Ormes campsite. These are the reviews for Domaine des Ormes campsite. There are 150 reviews. A lovely parc with lots on offer. We went end of season + disapointed that shop wasn't stocked, restaurants were closed, without a hire car we may have struggled to get provisions for the week. This should be made clear when booking for end of season. Parc too big, mobiles dirty, couriers (with notable exceptions) fairly useless. Lovely weather, fun on the zipwire& aquafit. Nice & quiet accommodation. (milly can sing!!! evening entertainment) good times!! Overall a good holiday, park was excellent but disappointed as to how much was closed particuarly the restuarants, the mobile was not fully equipped and my daughters mobile ran out of gas 2 days in, I think as it was end of season the interest was gone by park and staff, I understand that, we were disappointed in plot sight, as was totally out of sun and considering there was plenty of empty mobiles and I has asked for a good site I was again disappointed, no welcome wine, which was always a nice touch for old customers. I have to say we had been using key camp for over 20 years and are loyal customers, I dont think euro camp have the same loyalty or service, we will use eurocamp again as we love the sites and love france, but the last two accomodations have been pretty poor. sorry. we had a good holiday though and the young staff would help I am sure if we ever needed them, most the time we dont. The park is outstanding for facilities and service. . the accommodation was good but for some minor niggles. For example 1/ no lids for saucepans, 2/broken bathroom door lock, 3/ cooker hood light not functioning. These did not affect our stay but should have been seen by couriers and corrected before our stay. End of season or not . reduced cost recognised reduced park facilities but mobiles should be properly appointed at all times. It would have been a good holiday for value if we had booked one of your new value holiday parks. Domaine des ormes is a large site with lots of facilities but unfortunately as we were there in mid-september a lot of the bars and restaurants had closed for the season. the cleanliness of the caravan was not the best but overall we had a good time. lots of places to visit nearby. We enjoyed our holiday in this parc, it's a good size & there are plenty of activities to satisfy anyone even late in the season, I personally took the chance to try out an electric bike, only 10 euros for half a day which was a bargain with the exchange rate at the moment! the area also has plenty of great little towns nearby which are worth a look, the emerald coast is fantastic in a sunny day, cancale is a must at lunch time, also the old part of st malo & the walls are a good day out. The esprit home we were in was comfortable although some of the listed equipment was missing & instructions for using oven would have been useful! there was an annoying leak from the air vent in the lounge area whenever it rained heavily (drip, drip, drip..) but this was an inconvenience more than anything however the vent to the boiler leaked so badly during rain storms on a couple of occasions that the pilot light was extinguished, I spoke to one of the reps about it, this needs correcting asap. We would definately considering staying at des ormes again. We had a really great week here, the parc is outstanding with something for everyone. The couriers were not very knowledgeable about the local area when I asked about canals and cycling routes. The aspects were all crammed in a small site. we overlooked other aspect kitchen and bathrooms. considering the top end mobile was booked, larger pitches and space could be found for lesser mobiles. . one restaurant open and very limited take-away option. Didn't see a courier all week. No tourist/local information at all in the mobile. A large parc with lots of facilities, however a lot of facilities closed at this time of year. As always eurocamp provide good value for money. Even though we had a good holiday this was not particularly due to eurocamp or the parc. they were very inflexible regarding the arrival time even though the parc was not full nor did they accommodate our request of caravan placement. the caravan was not clean nor was the site of the caravan particularly maintained. the facilities of the site were ad hoc as they were closing down and although we were used to this, we did note however that when the weekend arrived and french nationals were there for a fun day, the facilities all opened up again for this visit. we have been many times to this site and so overall we thought that the site plus the eurocamp support had declined from previous years. Good facilities and lots to keep the kids busy. Lots to do nearby too. Next time we'll stay longer - end of season so winding down - loved the accostic guitarist in the bar - he was awesome!!!! Everything was just great, even the weather was kind compared to the forecast! Very good, apart from a slight hiccup with our original accomodation which was sorted by the couriers straight away it was a lovely break. Our previous visit to des ormes was around 1991, with eurocamp, of course. Much has changed. More lively, more facilities, parc is much up-market! good bike hire; but actual swimming space hard to find ( some pools closed by september). Great park. Lovely area. Would go again. The domaines des ormes site is beautiful and has much to offer both on site and also plenty to do nearby for day trips. the welcome at reception, both the main and the eurocamp desks, was very good. the accommodation, even though we'd booked the bigger chalet, was a little small, but absolutely fine for a week's holiday, although with a small child, I would've preferred somewhere with a bath - we had to bathe our 18 month old in the kitchen sink!!!. the indoor pool was absolutely lovely, toasty warm and not very busy as we had gone out of season after the main summer holidays. the shop on site was more than adequate for our needs, and there was a super u and carrefour supermarket nearby. we were a little disappointed with the eurocamp linen provision of towels - the bedding was absolutely great, but the towels were very small and even though we had three of us, they only gave us 2 x towels, although if we'd needed more I think we could've asked at reception. the toddler friendly stamp that eurocamp give this site is well deserved though - the accommodation had built in black out blinds, there were plug covers available, microwave, travel cot provided etc. The mini-fun station tent aimed for babies through to 5 year olds was awesome! when I first saw it, after the advertising on the eurocamp web page, I was expecting something a lot bigger (it's really little!) but there is so much to do in there; soft play, ball pool, arts and crafts, books and puzzles, toys - you can loan stuff on a sign out basis - and the girls there, lise and jenny in the main, were absolutely lovely and really were one of the reasons we kept going back. as well as the indoor tent stuff, there were also outdoor toys - a slide, water table, sand pit, rocking seesaw etc. also, the girls offered 'learn to ride' and 'learn to swim' sessions for free! unfortunately, we weren't told about these until the end of our holiday - the girls seemed to think the main desk should've told us, and we should've also received a visit or programme to our chalet. we did have a swim lesson with jenny and she was absolutely fantastic and we really appreciate her help. I can't sing the praises highly enough of the girls in the fun stations. We would definitely stay on this site again, although we'd look at alternative styles of accommodation but that is just a personal thing. As a site I have no issues with domaine des ormes. The staff are for the most part friendly and polite. Disappointed however that a lot of facilities were closed in early september. If you want to visit this site please use any company other than eurocamp. To say that their couriers were dreadful is an understatement. As far as they are concerned they are on an 18 30 holiday and customers are an inconvenience. Our accommodation was dirty, potty was disgusting as was booster seat. No cot or bed rail for kids despite ordering. Broken fridge shelf, 1kg of salt on seat, wasps nests, partying couriers in mobile homes next to us, even after we were moved, reps running around our pitch at all hours, I could go on forever. The reps ruined our holiday and just didn't care. Even the site manager wasn't interested and only moved us to stop me making a fuss in front of new arrivals. Please don't waste you hard earned money on a holiday with eurocamp. The reviews by other guests on trip advisor re reps are 100% accurate. Holiday completely ruined by lack of interest. Second time at this site and another good holiday. Not great weather but thats the way it goes sometimes. Always plenty to do here, both on site and the surrounding area. An excellent, very well maintained in a very good location. The only downside was the closure of the bar until 6pm after our second day. There were many families on site with small children who, after an afternoon swim, were looking forward to enjoying a short time at the bar before their evening meal and bedtime for the kids. This, they were denied. The bar is the focal point of any holiday and if the site is open then surely the bar should open from lunchtime onwards. Otherwise 100% rating for everything. Very dissapointed that the bar was closed during the day as it had outdoor seating areas which would have been nice to use during the sunny afternoons. It would have only taken 1 person to man this facility during the afternoon. They had golf club bar open but this we felt was imposing, & we felt we had to dress up to use this facility. They also closed the pitza restaurant. We felt that the we campers are a bit of an embarrassment to the owners, at the end of season & all they wanted were the golfers. Eurocamp team friendly and helpful and incredibly hard working. Parc reception staff welcoming on arrival. Sadly, there was an air of everything shutting down for the season. Bar opening times restricted and shop running down stock. Not too much of a problem as supermarkets a short drive away in dol or combourg. . although september, the weather during my stay was exceptional. Cycling in the area was fairly safe, drivers mostly considerate. The terrain was easy with only gentle undulations. . for a late season break it was fairly successful although, apart from the weather, not exceptional. The eurocamp felt quite tired. A lot of tall weeds growing around the mobile homes, one of the pools (the toddler fun pool) was shut for maintenance for our whole stay and several items that should have been in our self-catering mobile unit were missing. It just felt a little unkempt. Accommodation a bit grubby - eg blankets not very appealing with food encrusted on some of them. Fridge and toilets clean enough. not enough cleaning to outside space either. Really good value holiday in a beautiful location. Slightly disappointed on the penultimate day when we found the on site restaurant closed without having been given any prior warning! also the bar staff had dwindled down to two people which caused long wait times to be served, causing some people to walk out rather than wait!. I feel that staffing levels should be maintained to the day the parc closed and not "thinned out" before hand!! Worst holiday I have ever had . We had a lovely time! good site, friendly and helpful reps, good weather, great company and food and a calm ferry ride too! The caravan was a real disapointment it was not clean and the ensuite bathroom had an extremely strong smell of urine which was all around the toilet as well. We did not have the gas bbq as we should of when asked the couriers they just said someone must have taken it. The couriers were terrible with customer service. We have never had this problem before and it has put us off eurocamp. A great family holiday! the site is a perfect mix of activities and quiet time. We loved it. I cant recommend this park enough. It was my children's first time abroad and as a single parent, cost was paramount. This park delivered everything I could have asked for within a fantastic price range that I cant imagine being able to get anywhere else for that price. I'll begin with the few negatives I could struggle to find but they were essentially things out of the control of the staff such as the weather. I stayed in a safari tent which was awesome, quirky and fully equipped but it was cold at night even with the electric heater on. Having said that, it was only me who was cold, the kids slept really well and didn't feel it. Secondly, when I first arrived, I had to wait around for a good 30 mins before I was seen as the only courier on duty was showing other guests to their accommodation. Again, this can be forgiven under the circumstances. The only other complaint I would have is that the wi-fi for the majority of the park is chargeable although there is a free option if you want to go and hang around the bar/reception area. It would have been nice to access it for free from our tent. If these are the worst things I can point out then the good things would be too long to list. In short, amazing grounds with lots of lovely 'alternative' accommodation types such as tree houses and little onion shaped houses on the lakes that you can discover as you walk as well as the resident chateau/mansion with its own private helicopter. The swimming pools were lovely although a little cold for the outdoor ones most of the time but a lot of fun with the wave machine feature. The on-site activities were great fun for the kids and at reasonable prices although none of them took very long to complete. The local town of dol de bretagne has most necessities and other slightly further towns such as st malo and dinard are well worth a visit. I would thoroughly recommend anybody staying here to go and visit mont saint-michel and alligator bay which is round the corner. A great day out right there and reasonably priced too. All in all I would definitely go back but I want to explore further camps around europe first after being thoroughly chuffed with my first experience of holidaying with euro-camp. Fantastic camp site with great facilities for families. We chose this part for 1) its proximity to the port - it took us just over 2hrs from cherbourg on a fast ferry. Great. And 2) it was a toddler paradise park. This was the part we were a bit disappointed with. The park did have some great facilities, (duck pond, donkies, goats, play area) however it also had more stuff for older children so eg the pool was often busy with more boisterous older kids (and this was out of school holidays), a lot of the play areas were designed for 5yrs +, and the restaurant/takeaway didn't open until 7pm - too late for toddler tea time. . this park would be great if you needed to cater for a mix of ages, but if you've just got toddlers we certainly preferred the smaller set up at château marais. Nice park, but disappointed that the site and activities were already shutting down on 2nd september. Also requested 2 caravans next to each other when booked in october 14 for september 15 only to discover although same style in same area they were not together in fact they were not even within view of each other. There was also a complete mix up by couriers with the caravans when we arrived which after an 8 hour journey was not a good start. Due to this we would have to think very carefully before using eurocamp again. We stayed on this large camp for 1 night. We found the parc large and it had many facilities available, we didn't use any of them. Would not stay again didn't enjoy it at all, it was very big and impersonal, could be quite noisy at times. Felt uncomfortable. Very disappointing. We won't be booking another eurocamp holiday or recommending it. Whilst the parc was clean, beautiful, and the staff were fantastic, unfortunately, the lack of restaurant/cafes etc really let it down. We stayed at the parc, without access to a car, and as a result we were restricted to eating on-site. . the takeaway pizzeria was only open for 2 hours in the evening (starting at 7pm, which is late for families with young children) and the chez madeleine restaurant menu was very limited & the service was very slow. We looked at the prices for the other restaurant & felt it was too expensive for a family. . I cannot praise the eurocamp couriers highly enough though. They were really friendly & helpful & were immediately on the doorstep when we ran out of hot water & changed a gas bottle at 7pm with no hassle. . 3 members of the parc's staff are definitely worth a mention - the young man in the ice cream pink cabin was lovely & friendly, as was the chap who hired out bikes. The archery instructor was also brilliant & subsequently made the archery our favourite activity that we took part in. . all in all, we had a good holiday, but was slightly disappointed in the lack of restaurants & evening entertainment. We had a great week at this site, lots to do even if the weather isn't always sunny. Great outdoor space. Fab holiday. Was very cold overnight and couldn't leave gas heater on. Wish we'd had electric! . very disappointed our group were so spread out. Next time will book with another operator on the same site who allow you to choose your actual accommodation in advance so the group can be closer. Pools a little run down. Play park could be better. In general, the place was looking a little tired but we were there towards the end of the season. Disappointed that things started shutting down on our second day - half the pools and the restaurants. Park staff did not deal with consistent loud noise through the night and just waited for the offenders to leave (after 3 nights of us having to contact security late at night). good range of activities although some a little expensive. Kids club staff very good. Toilet block very close, good amenities and kept very clean. We went for a 5 night holiday bit came home after 3 as I myself got poorly, the site is huge, we only used the indoor pool as it was a little chilly to go outside, we went on 31st august but although a very large park there isn't much to do with our 3 year old once it's turned 5pm so then it was sitting in the caravan. Lots of things to book like climbing pony riding golf water sports but everything is more money all the time so then works out very costly. The area especially dol was lovely great shops & great food . A super holiday for our grandchildren. Staff were very helpful, even though we didn't arrive until 2 in the morning we were looked after really well.facilities were clean and modern, loads to do and the safari tent was brilliant. We were very impressed on arrival by the beautiful site. The eurocamp were very friendly and welcoming and continued to be throughout our stay, if we bumped in to them, they always spoke to us and they checked on us, calling at our mobile twice during our stay. The facilities were great. We were just a little let down by the weather, which is out of your control of course, we were hoping it would be a little warmer. But we enjoyed it anyway and had a good time. the outside swimming pool wasn't open during our stay, but presumably this was because it wasn't warm enough. we also enjoyed exploring the area and visiting nearby tourist attractions and towns. Great place for our family of sporty people: mum, dad and 12 & 10 year olds. The golf course is well worth it. The fishing fun. Near attractions and lots of swimming, archery, parcours. Great place for family holiday! Park has lots of facilities especially for children. Our second visit to this park and we all still loved it. the couriers weren't on the ball this year but nevertheless we thoroughly enjoyed our stay. A good location for visiting st malo and mont saint michel. Lovely coast line and quaint villages aswel as good large local supermarket in dol de bretagne for self catering. We initially had issues booking the holiday via the website so called the call centre which I would highly recommend they were so helpful booking what I wanted and even getting us a good deal on the ferry. We travelled over on the fast craft run by brittany ferries and the staff were fantastic it was quite a rough crossing so lots of people were sick the staff kept an eye on everyone offering assistance where needed I was so impressed that I would not hesitate to travel with them again. The parc was good but more suited to older children and its huge. There also seemed to be loads of wasps everywhere which as I am terrified of them meant that I was quite restricted to the point I couldn't even sit outside. The on site entertainment seemed to be very good but the shows at night were a bit late for our children as they seemed to start at 9pm. Swimming pools were lovely and the whole place was very clean. The accommodation was basic and was very tired looking which I sort of expected as we stayed in one of the caravans due for replacement. Although we had a very nice holiday I don't think we will go back to this site as it was just too big for us we will however use eurocamp again. The bad weather never helps, but the camp was run down and never clean. there were 5 changing rooms in the swimming for hundreds of users. the communal toilets were generally dirty, and out of toilet paper. the restaurants could not cope with the demand and had long waits. . I will not be rushing back, which is a shame as I was hoping that eurocamps would be our families future. Firstly, ditto all the comments about problems with wasps and the couriers being just kids themselves, lack of sun beds (plenty of space to sit on towels though), lack of footpath through main site being dangerous with young children, and the need to bring your own sharp knives/cooking utensils in caravans. . accommodation / site location:. firstly the negatives: from the brochure we expected a nice woodland location and space to let the children play around the caravan. In reality our caravan was situated no more than five arm spans from a huge electrical pylon (which buzzed in wet weather)! there was no fence around the pylon. We have children of 6, 4 and 2 years old. We immediately asked to be moved, and raised our concerns with one courier and then his immediate supervisor. They offered sympathy, but no more. We asked to move vans, but they said the rota could not be changed (we noticed at least two 3- bedroomed vans much further from our pitch empty for two nights following our arrival, so there would have been plenty of time to re-jig the rota to accommodate our concerns). we also offered to move sites, but apparently any eurocamp that resembled the one we had booked was completely packed out (hmmm…given the weather was pretty torrential I would have expected some cancellations). we also suggested that we would be prepared to move as soon as a van was available, but apparently the only van available would be four nights into our stay and we would have to move out of our accommodation (next to the pylon) at 10am, and wouldn’t be allowed into the new accommodation (further from the pylon) until 3pm that day. This sounded like a day-zapping, time- of- disruption proposal to us. Eurocamp staff had obviously been trained in the art of ‘be polite but look blank’ as a customer complaint response. . . I would suggest you think ‘cornwall’ when you think brittany, eg. Lots of rain and so therefore the campsite was quite muddy and accommodation was persistently damp. The caravan, a ‘comfort plus’, was indeed very damp, tired and pretty grotty looking too (oh, and don’t forget next to the buzzing pylon!) remember to bring wellies and a lightweight raincoat with you. Some of the tracks around the park were muddy. . . customer service / staff. On a separate issue, we asked to hire some duvets (caravans are stocked with dirty looking itchy woollen blankets only). eurocamp staff said all the duvets to hire were out, all of them, every one. Thankfully the camp site staff (seemingly a very different organisation) said they had three left, and for a fee and deposit, we might possibly borrow these. Less than 24 hours later we did a bit of a recky of the park and stumbled on the eurocamp reserves (all piled up haphazardly in a few tents on the site perimeter). plenty of duvets, in packets, tucked in there. Eurocamp staff were all so young; they were pretty much all on summer breaks from uni and really didn’t care too much about customer satisfaction. One of the kids camp reps even said, ‘they put us in tents on the outside of the camp because we’re noisy, having too much of a good time in the evenings.’ yes, indeed they did, and while I do appreciate this (as I was young once), now as a paying customer I think not being lazy and fetching some duvets wouldn’t have inconvenienced eurocamp staff’s party life too much. . with eurocamp ‘managers’ being just 20-22 years of age (as I had a good chat to a few of them), they didn’t have a great deal of ‘management’ experience. This was most notable when listening to the managers being downright rude to their team members. The kids camp manger in particular really needed to go to management school; she was quite excited by sitting round eating brioche and tutting at staff trying work out timetables and borrow resources. Plenty of parents were listening in on her many outbursts, and although entertaining, not exactly professional. . . the positives:. soccer school:. but saying this, the soccer school staff, well two of them anyway, were absolutely excellent. The one collecting money from parents just sat about grumbling about the weather, and speculating about what excitement lay ahead that night, but the two coaches doing all the work were brilliant. I believe they were on training programmes with universities doing pe education; they will both go really far. My six year old was thrilled to get a goal, as staff painstakingly made sure every kid on the pitch got a touch of the ball and opportunity to save/ score (and there was a huge age span- 5-14 year olds, so that was quite a feat). I was really impressed with these coaches; they were extremely encouraging, very patient and obviously very skilled footballers themselves. . the eurocamp kids clubs:. on a rainy day (and we had three during a one week stay) the kids camps were absolutely brilliant, giving my 6 and 4 year old an organised two hour activity, and providing us with a opportunity to visit some nearby french towns (albeit in torrential rain). the eurocamp clubs are located in very small tents (so be warned, the area is still muddy and a little cold). the sessions run from 10am-12noon and 3pm-5pm, and you get your kids in on a ‘first come first served’ basis. We were in the queue by 9.40am as not to be disappointed, as the clubs only have availability for 16 children (led by two staff members). on the wednesday there is a 10-2pm session, which staff told me was always packed out as it offered parents longer to venture further without the kids. There was a small additional fee for about half of the sessions, eg. 2 euros for ‘breakfast’ or as a contribution to the ‘chocolate party’. make sure you arrive early, have some cash handy and send your children with a drink and a coat. The staff take the children to the toilet regularly in a nearby toilet block. . . the ‘learn to ride’ session was run by a kind and patient member of staff who also supervised the 0-2 years ‘mini campers’ sessions advertised in the eurocamp brochure. Just to stress that these sessions require parents to stay with children. It does say this in very small print on the website, and we understood this before booking, but several families were turning up to leave their little ones and seemed somewhat disappointed. These sessions were unstructured, but did provide a welcome 40minutes of play for my two year old with some new toys, play dough and drawing materials. . swimming pools. There was a good choice of pools at this campsite. One ‘covered’ (note not ‘indoor’ or especially ‘heated’ so cold on rainy days). there were also two sizeable pools outdoors with plenty of slides perfect for my age range of children. the wave pool was really good (strong waves turned on for a good length of time) and all pools were gently shelving so perfect for toddlers. the lifeguards had a sense of fun rather than being the super authoritarian-type, but enforced the rules well too. We enjoyed seeing some of the lifeguards whipping down the slides at the end of the day, and the chief lifeguard (who’s worked at the pool for eight years, 18 years as a lifeguard) went out of his way to point out to newcomers were the depths changed and which slides would be best for my younger children (really impressed with him). the highlight of the holiday for me was the pool side entertainment provided by another holiday company sharing the campsite. The enthusiastic aqua fit team were completely undeterred when the amplifier gave out, and managed a full version of ‘uptown funk’ without backing track. It had the ‘hi-de-hi’ spirit. . . bike hire. The bike hire was reasonably priced and a half day session was a generous 5 hours. The bike hire was open at 10am until 8pm (we were there peak season), and run by a really nice charismatic gentlemen. The bikes available are ‘holland bikes’ and I recommend hiring the tandem if you have children over four years of age. The basket bike, which allowed you to push along up to four children in the basket was hard to steer (though fun) and you needed to be chris frome to get it up hill (or so my husband thought!). . pony trekking. Just a word about this one: the track of the reasonably priced ’10 euro’ pony ride around the campsite was very slippery in parts, wear good shoes. Staff do not accompany parties on these walk, and parents are solely responsible for the pony and its rider. The pony in front of ours was spooked in the wet weather and muddy track down hill and lost its infant rider. The poor parent then had to lead crying child and pulling pony back round the campsite wearing an uncomfortable looking pair of flip flops. . . the campsite. The campsite park is vast and the brochure absolutely undersells the park as a place to be for nature lovers (somewhat ironic for us given we had the worst pitch next to the pylon!) the woodland is mature, and meadow grassland lush and abundant with wildlife (the stagnant ponds on site are not so beautiful though). the park backs on to a bird reserve, and open farmland, and a pretty french village (which had a good market day with fresh vegetables on sale on sundays – great destination for a bike ride). the park also incorporated a huge golf course, and although this was nice to look at, golfers were telling holidaymakers off constantly for trespassing (quite rudely at times). the paths around the golf course are not well signed as to which are public and which belong to the golf course only. Part of the camp is also open to wedding parties, and again, there was a lack of signage forewarning holiday makers where they had right to roam. at times the park felt a little like it was trying to be everything to everyman. An upmarket golfing paradise, a mud heavy campsite for big families (very vocal around the laundrettes), the french equivalent to centre parcs (with all the outward bounds activities available), an eco-friendly adventure with the treehouse accommodation available, eurocamp staff party central, and a sort of haven holiday abroad (with the provision of some evening entertainment- though this was all on very late at night, 10.30pm for fireworks so far too late for my age range of children). eurocamp also share this site with canvas holidays and matthew holidays, so if the site appeals, and not the ‘eurocamp’ element necessarily, check out these other providers for a competitive price. For us, ‘eurocamp’ really does appeal, and was the big pull, as we did appreciate the eurocamp kids clubs on the wet weather days. . . summary. I think all the other comments on here do good justice to other elements of the site. I would definitely return to this campsite and even recommend it, but next time I would stress in all correspondence not to be placed anywhere near the pylon. I felt that eurocamp should not have bought this pitch (it was the only eurocamp pitch for a way around) and I really was so disappointed not to be able to let my children kick a ball around on their own outside, for fear of overhead wires and pylon zapping us. Perhaps with older children the pylon would have been much less a risk, as it’s easier to reason with a eight year old (sometimes), than make a two year old understand, ‘not near the large exciting buzzing metal that looks like a good climbing frame!’ besides this unprecedented danger though, the park really did seem ‘toddler friendly’, with gates available for the ‘urban living space’ caravan decking, and booster seats/ travel coats provided in the vans. . we had a fantastic holiday, plenty to do on site and three hours at a time spent in the pool (well the kids, not me, too cold for me!). the surrounding area was far more impressive, beautiful than I had imagined (st malo, dinan and dol de bretagne- lovely places). I would definitely like to go back to be able to explore further. all-in-all, a thumbs up from us. . Overall a good holiday. We stayed at pointe st gilles in benodet and domaine des ormes - had stayed at both sites before so knew what to expect. Excellent parc, lots closed but plenty still to do. Wonderful pool, useful shop. Great holiday at a fantastic price. Although there wasn't much open on site when we were there it was a lovely setting and very good accommodation. We wanted a relaxing holiday and that's what we got. First time here, loved it. did not see the couriers much but they seemed ok.
Accomadtion could do with updating, but the park itself is very nice and the staff are very helpful. We stayed at domaine des ormes, dol de bretagne in mid-september 2014 and used it as a base for a motoring/sightseeing/eating holiday. It was very late in the season and the campsite was beautifully quiet. The parc is one of the highest quality sites we have been on and the setting and drive into it are amazing. the eurocamp staff and the parc owner's staff were absolutely great and we had lots of laughs with them in the bar in evenings. The general setting of this site is amazing and spacious. the facilities (when open) are very good and exceptionally clean. Highly recommended! Our holiday was very good. after all, holidays are what you make them! Super parc with lots of features. Very disappointed to have everything but the swimming pool close down 2 nights arter our arrival for a 14 night holiday. We were in the park during their close down and this was evident. The couriers appeared to be a pack down team, mostly interested in packing the site up. The site itself was not toddler friendly as described. Any one who has ever holidayed with a 2 year old will know a site that opens and closes activities, especially swimming pools and water slides on a random basis which no one is able to understand, is not a recipe for a calm and tantrum free holiday. There was plenty to do on this site but also the opportunity to relax. the on-site shop was useful and sold a range of goods. good location, short drive from nearest town and just a 15 minute walk to the local very small village. Domains des ormes is a fantastic park and really suited to familiies. If you go in september, be prepared that some aspects will be closed. The mini station for under 5s was open but none of the other kids clubs - probably because they assume over 5s should be in school. The site is managed by a different company so eurocamp have no control as to what is open/ closed. We were lucky that because of good weather the site agreed to reopen the outside pool complex with slides that had been closed. Because september is classed as low season there were very limited options for getting food on the park as many places were closed or on limited opening hours. This was not an issue for us but maybe for others. Eurocamp couriers were always friendly when we approached them but apart from check-in and once going to reception for a query we never saw them. Park was very peaceful and relaxing in september. No problems with noise at night or rowdy behaviour at all. Would recommend taking a car to explore the local area. Also the super u in dol is fantastic value for money and kept food costs down to a minimum. Overall a fantastic park - just check if the stuff important to you will be open. Excellent campsite, great facilities. Lovely location with plenty of things to do in the area. This parc is still good, however the some of the changes have had a negative effect on the overall experience. the way the parc is now set up is very squashed in some areas, particularly near the lake/cricket pitch. the introduction of tents in this area are not particularly attractive and it also meant that the mobile homes had been squashed together which meant as a visitor there was less seclusion and it felt very cramped. Excellent parc and facilities. Good supermarket and pool area. Wish we had stayed more than one night! excellent pool facilities, we came as three adult friends in september, no kids around, would come again as a group. 3 bedroom accommodation was fine, bed comfortable and linen included good quality, though room with bunk beds was a bit too 'close' for the person in that room. The restaurants were all closed during the day, I think the bar had opened by early evening. This is a perfectly good site which im sure many people love. For us it was just a bit big. They seemed to take a bit of pride in telling us things were closed for "low season" and it did have that feeling of closing down for the winter. Its a good site with great facilities and I would think excellent for families with kids a bit older than ours. Overall a great site for kids and we would go back again. lots to do for kids on the site itself plus there are a number of towns to visit within 30 minutes drive away for a day or an afternoon out. The on site cafe/ restaurant/ takeaway booth choices aren't great, I expected more on such a big site. I found the eurocamp staff to be really friendly and helpful. The location is stunning and out of season there is still plenty to do with preschool children. In fact the site was peaceful and relaxing, but we still had use of the large pool complex, clubs, cycling and riding. The couriers are friendly and helpful. Pretty much perfect! A very good holiday weather was on form no traffic jams just relaxing. 3rd year in a row we have been to this parc. Really enjoyed the holiday. One thing to be aware of is that the restaurants start closing down from the 7th september. The bar is closed during the day from the 7th september. Good. Large park. Only stayed 1 night at the end of season. Unfortunately no restaurants were open and shop and bar closed at 6.30 so difficult to get anything to eat and drink. Has a good pool complex and children's activities. Im sure it would be a great park to stay on but not at the end of season. we had a large pitch in a old keycamp mobile now run by eurocamp which was fine for 1 night but would pay extra to upgrade to a better mobile if staying longer. Excellent holiday overall. Beautiful area! lovely weather. Great parc really good facilities and lots to do. Couriers were helpful and friendly. Accommodation (esprit mobile home) was spotless. It's a small point but if the parc had a cafe on site that was open earlier in the morning it would have got a lot of our business. Other than that can't fault anything. Overall we enjoyed our stay and excepting it was near the end of the season so that some areas of the park and accommodation will appear to look and feel a little untidy,we feel a bit more attention to detail would of allowed us to rate you higher.general cleaning inside and outside of accommodation on arrival could have been better.ie swept and mopped floors, litter removed from outside.rodent population especially around recycling and rubbish bins needed addressing.all the above was mention to two couriers on separate occasions. Highly commendable camp , we intend to visit domaine des ormes. Next year again . An excellent venue with plenty to do for all ages. Well definitely consider going back next year. 2nd time at the site two years after our original visit. Had a great time again and most importantly the kids loved it. A couple of minor gripes: there was a noticeable reduction in staffing levels, whether in the bar, restaurants, activities or facilities..to the point where queuing and waiting became a frustration. The oh other issue is what seemed a reduced programme in terms of activities. While all the same activities were offered they were not run as regularly as previously meaning we had to book events days in advance. . minor issues and overall it remains a great value holiday with plenty to do. The accommodation was clean but basic, we did have to chase up the eurocamp reps for the double duvet as that wasn't left in the caravan when we arrived. Apart from that the reps were all very helpful and friendly. Would book again if the price is right. Domaine des ormes is a fabulous site for families of all ages. There is just so much to do from pony rides to paintball. It can be as active or relaxed as you want it to be. Plenty of space for kids to run around and play and the pools are excellent. The entertainment is great especially the indiana jones show with the fireworks-a perfect end to the perfect holiday. There are lots of lovely places within half an hours drive to visit. Mont st michael, dinan, st malo, combourg and cancale for oysters! our second holiday here. Nice parc, lots of facilities and things to do, however, accommodation only average. In the baby room, the mattresses that were left stunk of urine, something you would have thought would have been addressed before we were given the home. It was sorted when we complained of the smell. Despite this, overall it was a good holiday - friendly couriers, good parc facilities and nice location. This is the third year in a row that we've been to domaine des ormes, and we had another great time. Good to see some changes to the facilities (new water slides). We spent 2 nights in a tent which was great, then moved to a tree house. we were all really excited about it, however, it was incredibly dark. the camp provided several very poor lanterns. the houses needed some sort of windows in the roof and for the trees to be pruned back so as to let a little light in. also when sitting on the lovely terrace, you could not see the lake as the trees were over hanging so far. . a safari tent was provided for cooking, but that was so far in the trees that it never got any sun either. . . a lovely idea but in need of some lights or pruning needed. due to lack of light it was a little damp and difficult to dry swim wear. . the swimming pools and other areas make a fab reasonable holiday for all the family. A great parc with lots of fun things to do - some of the extra activities were a bit pricey. Accomodation is very basic but overall we really enjoyed ourselves. A good family holiday. We have been twice and look forward to returning. Loads to do in the park and plenty of places to visit nearby. We stayed 8 nights. Stayed on the park and traveled alternate days. One word of warning when leaving we headed for the roscoff ferry and nearly missed it due to a bottleneck traffic delay - both years. We left the park saturday afternoon and there was a 1 hour hold up near/after the turn off from the motorway to dinard / st malo. Factor in an extra 1 hour no mater what the sat nav says if traveling peak times. . places to visit nearby, dinard beach, st malo. The aquarium at st malo and then a walk into the old town. Mont st. Michel. Comborg. . the park site has a few resturants, nice take-away pizza and a good conveinence shop. Lovely holiday once we arrived a day later than booked owing to a ferry leaving earlier because of the weather and eurocamp telephoned our home line and we had left the previous day. Hadn't asked for mobile number. Eurocamp kindly added a day on the end of our stay. We had a lovely 4 day stay before moving on to normandy. Only the weather didn't live up to expectations ! Our holiday was towards the end of the season and we were disappointed that some facilities were either closed or subject to shorter opening hours. A lovely holiday but due to the surrounding area rather than the camp. having a five week old baby with us, and you knowing this fact when we booked we thought that the park homes would be well heated or at least well insulated. But having paid for an upgrade we couldn't put our baby in the room as it was far to cold, not happy about that at all! other than that I found the homes very basic indeed and would not recommend them. the grounds were well kept, but most of the facilities seemed closed although we did know this when booking. Overall a good experience at the park. We only stayed at the parc for a couple of days on our way to the gironde - nice parc but as it was the end of season some things were not in full service.the shop had very little stock and the restaurant and lagoon pool were closed. As there were still quite a numebr of holiday makers it is a sham ethet the parc cannot maintain full faliclities until the final day. Hi we enjoyed the holiday until there was an incident in the family bar where one of the staff threw a glass along the bar nearly hitting my partner.then the same person started fighting outside the bar with another colleague which is not very professional when there was young children around put downer on the holiday a bit. Overall we enjoy our stay. A beautiful parc and we were generally happy however we were not aware that most of the activities would be shut the week prior to out arrival. . the tent did not have a hairdryer or heater as we had been advised they had, however the staff tried their best to assist us when they could. . the bikes we hired are not fit to be used, and are dangerous and uncomfortable. They need to be replaced and stored properly inside as they are getting wet and maintained by a bike mechanic. It would be really good if you could also mark out your bike routes it would make them much easier to follow and user friendly for families that aren't used to cycling. . This was a really hard place to find passed the opening twice. Need better signage for the park. Lovely holiday for an adult couple wanting lots of rest and relaxation. Most of the facilities had already closed for the season so if we were a family with children we would have been disappointed. Only met one eurocamp courier briefly to ask for an electric heater, a keycamp courier showed us to the tent!. highly recommend the safari tents! shower and toilet block was immaculate. We love the site and the area however at this time of year very quiet and most things are closed. Hello, I have scored the accommodation low because the caravan was not clean . the first van was unfit to stay in the couch was tatty and the matresses in the single bedroom was unfit to sleep on and the blankets were stained so I complained and was given another which was slightly better but I still had to clean the floor and all the unit tops also the patio furniture was dirty, I do believe keycamp should employ and older person to overlook the vans when theres a change over and I think the cost of the holiday is way to high .hate complaining but the van was just not clean enough and spoilt my stay. I also think the blankets should be cleaned at every changeover. A mobile home offers a relaxing break during the low season, and the low season price makes it affordable. We found that most of the facilities were closed, including the resturant. We then had to spend more time and money off site to eat and entertain ourselves. Shame, could have been good!!! Very nice park with lots to do especially for the golf fanatics and the local towns were beautiful. Many of the site facilities were either closed or operating on a restricted service/availability basis. Travel information not realistic as to required travel duration to site. Couriers seemed not to be well informed about site's reduced operation and surrounding area. A really beautiful camp in a wonderful setting but as we visited in september the restaurant closures and other facilities were really disappointing. the poor weather did not help!